NYC Crashmapper displays data from the site where ##http://www.streetsblog.org/2012/08/29/trucker-who-killed-jessica-dworkin-cited-for-careless-driving/##Jessica Dworkin## was killed by a truck driver in 2012. The map will update with each new NYPD data dump. There is a new mapping tool that presents NYPD crash data in a way that will be useful to advocates, electeds, and citizens who want to improve safety on neighborhood streets. A bit of background. For years, NYPD guarded traffic crash data like a state secret. After the City Council forced the department to make the data available to the public, it was first released as a series of PDF files. This wasn’t very helpful in targeting crash-prone locations for increased enforcement or design improvements, which, contrary to NYPD’s fear that data would be manipulated to “make a point of some sort,” is why electeds and advocates wanted the information published. Enter freelance web developer John Krauss. Last year, Krauss began scraping crash data from the PDFs, with help from Transportation Alternatives and others, and posting it in multiple formats. Now he has translated the data into a multi-functional map that looks a lot like what street safety proponents were aiming to get from NYPD. NYC Crashmapper loads as a heat map, and reveals specific crash locations as you zoom in. Data is searchable by month, and can be filtered to show crashes, collisions with injuries, the number of people involved, and injury type per mode (pedestrian, cyclist, motorist, vehicle passenger). Krauss says more filters will be added, including fatalities for all collision types, vehicles involved, and contributing factors. With this map, anyone with access to an Internet connection can pinpoint where traffic crashes are happening in their neighborhood. 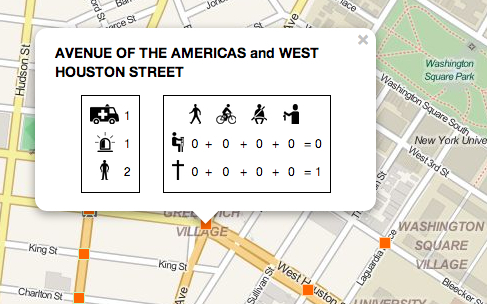 The map will update automatically each month, and will reflect historical data updates from NYPD. Updates will be tweeted @crashmapper. This is really interesting and will be incredibly useful for a variety of purposes. I would like to see crash data compared with bicycle facility type and volumes of cyclists using those facilities. To that end, it would be useful to have a feature that adds up the crash data over time. Each month is too small a sample size to draw any real conclusions, but if you can see a year or two worth of data on a map at once, you’d really start to pick out trends. Good point. The original data report does not classify the victim. I believe it’s common for (other) gov’t agencies to categorize anyone not in a vehicle or on a bike as a pedestrian. Yep, that’s probably been the most frequent request. I should have some time next week to add it! Yeah, what about 0 + 0 + 0 + 0 = 1? Will Bratton Open Up Data on Traffic Crashes That Involve NYPD?